The Year One Edition takes the existing content, polishes it with improved visuals, and bundles it up for the current generation. The new version of State of Decay isn't just a graphical overhaul, it features new content and carries the improvements of the later updates (Breakdown and Lifeline) throughout the three-part experience. Undead Labs has overhauled one of the weakest parts of State of Decay during the conversion. Unarmed combat now affords every survivor a knife. This allows players to quietly take down one or two zombies, but as you might expect, it won't do much good against a mob. There are new missions peppered throughout the game now. You'll receive mysterious messages on your radio that will lead you to supply drops. These will contain top-tier weapons, but you'll have to fight for them. The crates have noise-making beacons on them. Since noise attracts the undead, you'll need to fight through, shut off the beacon to stop the flow of corpses, and get out safely. 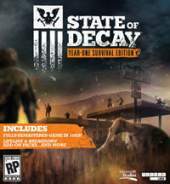 Those that own the original State of Decay will earn a $10 credit toward the purchase of the new version. Those players will also unlock a unique survivor that includes a gun with a built-in suppressor that doesn't degrade.